Podemos leader Pablo Iglesias talks to Jacobin about the Catalan elections, the future of Spain’s left, and the fight for state power. This week’s regional elections in Catalonia bookend a turbulent year in Spanish politics. It began with Podemos’s heated party congress in the spring and was followed by the re-election of Pedro Sánchez as PSOE (Spain’s Socialist Party) leader, with the summer months dominated by speculation over a possible future pact between the two parties. A predictable string of Partido Popular (PP) corruption scandals then provided the backdrop to the attempted referendum in Catalonia on October 1, which has consumed the political agenda at year’s end. The Spanish right have capitalized on the thorny complexities thrown up by the Catalan independence debate with a renewed campaign of nationalist fervor. Most polls indicate significant electoral gains for right-wing party Ciudadanos in Thursday’s election, while En Comu Podem, Podemos’s Catalonia affiliate, and radical independentists the CUP are struggling to make a breakthrough. Meanwhile, the road ahead for Podemos nationally remains unclear. The party’s attempt to walk a tightrope during the crisis — endorsing Catalonia’s right to decide but proposing instead a new plurinational Spain — has drawn vitriol from the country’s right-wing establishment without managing to command significant support inside or outside the region. But Pablo Iglesias remains defiant, arguing that his party’s proposal to the crisis in Catalonia remains the only viable way out of the deadlock. 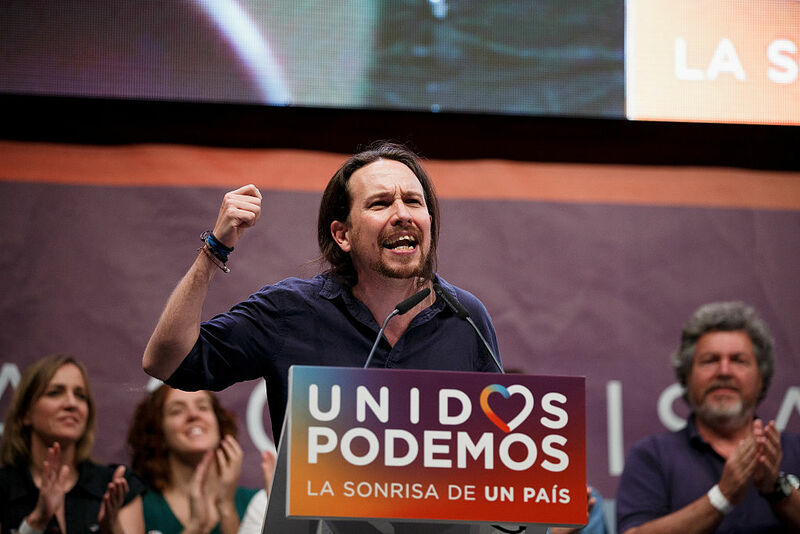 Podemos, he says, still offers Spain its best hope of a break with its political elites and their crisis-ridden regime. He spoke with Eoghan Gilmartin and Tommy Greene about his views on the Catalan crisis, the challenges it poses the country’s left, and Podemos’s enduring desire to transform Spain by winning state power. The standoff in Catalonia has been one of the worst constitutional crises since Spain’s transition to democracy. How would you explain the events of the last few months to an international audience? Spain is a plurinational country. In some countries, this kind of composition is easily recognized. An example would be the UK, where English, Scottish, Welsh, and Northern Irish identities coexist. This is also the case in Belgium and Switzerland. There are other countries, however, where there is a clear correspondence between the state and the nation. This is the classic idea of the nation-state coming from the French and the American Revolutions, in which state and nation are aligned. In Spain different national identities coexist but they do so in a way that is disjointed. For example, inside Catalonia, Spanish national sentiment also exists [as was seen with the recent pro-monarchy demonstrations in Barcelona] and this is also true of the Basque Country and Navarre. And, at the same time, there are territories in Spain with identities recognized as nationalities, although without having any intention of separating — such as the Valencian Community and Andalusia. As a consequence of these identities, there is political conflict as well as diverse institutional arrangements. Therefore, there are not only cultural differences but also distinct judicial systems, with different civil law in Catalonia to the one operating in Castile. During recent months, we have witnessed the unfolding of the independentista strategy of unilateral “disconnection,” which has led to a dead end. We are now at a point where, on the one hand, we have a right-wing government backed by a broad block of pro-monarchy parties, as well as by the entire judiciary and the power of the state, which is unable to provide an inclusive proposal for Catalonia or to redefine the Spanish constitution territorially. On the other hand, we have an independence movement with an exhausted strategy: having seen what it entails to confront the central government, it is left with few moves going forward. Instead of this impasse, we need dialogue to reconstruct the state as a plurinational entity. We in Unidos Podemos defend Catalonia’s right to a legally negotiated referendum. Though not pro-independence, we are in favor of recognizing Catalonia as a nation and see the need for a new constitutional framework, or adjustment, recognizing this fact. A number of Catalan leaders who had been imprisoned have been recently released on bail. But the escalation to the point they were imprisoned at all was remarkable. What do the last two months reveal about the state of Spanish democracy? The imprisonment of elected politicians reveals deficiencies in Spanish democracy. We have always talked in terms of political prisoners, even though this does not necessarily mean we agree with their core beliefs or strategies. We think that, in a democracy, political conflicts should be resolved through political channels, not with police intervention. There is no judicial solution to the Catalan problem but there are political solutions which will later inform the law. Democracy should be the source of the law, not the other way around. It is outrageous that the current scale of corruption in the governing Partido Popular has been met with such impunity, while Catalan political leaders are imprisoned under charges that many legal officials see as having little basis. This has been made evident in the withdrawal of the demands for [Catalan Premier] Puigdemont’s extradition. The Spanish government feared that, in a Belgian court, no substantial charges could be pressed against him. This exceptional situation paints a worrying picture of receding democracy. What are the roots of the current crisis in Catalonia? The territorial crisis accelerated when the PP decided to rupture the territorial fabric of the country. There was an existing agreement in place that had been approved in Catalonia both by the Catalan people and parliament, as well as in the Spanish Congress. This agreement established a new Statute for Catalonia that would provide territorial guarantees which had not been covered in the constitutional text of 1978. The PP coerced the Constitutional Court into excluding some of the articles agreed upon in the statute and, in this way, the territorial setup was permanently impaired. Support for independence in Catalonia, which had always remained at around 10-15 percent of the [region’s] electorate, began to grow. But the crisis is also part of a broader phenomenon: the political, constitutional, and social crises we have seen in recent years. So we need a new comprehensive agreement which enshrines social rights. This should recognize Catalonia as a nation, and should also convey the idea that different nations can share a state, and that the vision of Spain, understood as plurinational, can be appealing to all territorial sectors. We need an agreement that safeguards democratic institutions and protects them against corruption, one that guarantees and preserves judicial independence. To achieve this we talk about a “constituent impulse,” rather than a constituent process. We still do not have the necessary consensus to realize some of these proposals. What we look to is the idea that there can be extended, meaningful debates within Spanish society about social rights which could lead to these kinds of constitutional reforms. Its end point would mean the construction and realization of a plurinational Spain both institutionally and democratically. The Right’s response to the crisis in Catalonia has been to wrap itself in the Spanish flag as a means of justifying repression and diverting attention away from uncomfortable realities. How potent is this as a strategy? And how can the Left answer it? Tactically, what they are doing is very intelligent, but strategically it is a disaster. On a tactical level, they have managed to wrap themselves in the flag so as to conceal and dissimulate a series of nationwide problems which had been hurting them politically, namely corruption and inequality. They feel comfortable in this position. This is something we try to communicate to the pro-independence sectors: effective politics implies generating contradictions in the opposing forces. If these contradictions are not revealed, you set the ground for your adversary to rally and unify. In this sense, the hard-line speech given by the king on October 4 managed to unite a pro-regime monarchical bloc. It said to them that Catalonia is the priority and that they could survive by focusing on it. Politics is about the capacity to change things, not merely your principles. In fostering the unification of its adversary, something in the independence strategy went badly awry. But, at a strategic level, the Right is completely lost. It is unable to offer any wider project of renewal for Spain. The discourse of the monarchy as well as the parties that support its line excludes large sectors of the population in Catalonia, the Basque Country, and Spain as a whole. They may have temporarily managed to gain the approval of the majority but they have left aside something the Right has attained in the past: the ability to compromise and reach agreement with its adversaries. The famous encounter between Prime Minster Adolfo Suárez and the Catalan leader Josep Tarradellas in 1977 enabled the re-establishment of the republican institution of La Generalitat in Catalonia. It was an agreement between Spain’s traditional elites, the Basque elites, and the Catalan elites, and has to be seen as politically successful. Though terrible for the Left, it was capable of providing a national project that brought forty years of political stability. The Right of today may still be comfortable holding power but they are unable to win legitimacy. You have talked about the need for a new plurinational patriotism in Spain. What would the content of this patriotism be? On the surface, the Spanish right has managed to equate the idea of Spain with the monarchy and the single nation-state. Pro-independence supporters embrace this reactionary vision of Spain. In fact, we are the political opponents the independentistas are most concerned about, since our idea of Spain is appealing to Catalonia and the Basque Country. One of the historic difficulties for the Spanish left after the civil war was how to combine an idea of Spain with its own political identity. To a certain degree Podemos has overcome this problem. But our model implies dropping certain complexes and assumptions of the historic left. In particular, our symbols and narrative cannot be based on left-wing revenge for past defeats. For some of us, who are the grandchildren of those who lost the civil war and the children of anti-Franco militants, this can be painful. But it is something we need to recognize. So when we say republican values can serve to inform a new idea of Spain that looks ahead to the future, we are referring to a plurinational Spain, one in which republican patriotism is understood as the reclaiming of civil dignity and of the res publica [public affairs]. The res publica stands for public schools, public education, state pensions. It means caring for the various peoples and citizens within Spain, declaring its pluralist identity. Is there a class dimension to this plurinational identity? I would say so, yes. When we speak about popular sectors and assert the rights of the social majority against the elites, we are making a diagnosis of the class composition of our country much more accurately than those who have a nostalgia for an industrial working class. We live in a society in which the fundamental characteristic of young people’s work is precariousness and that implies a form of cultural socialization very different from the traditional blue-collar jobs. In a tertiary society, wage earners do not have the same image, style, or characteristics as the working class of other periods. At the same time, we also have to operate in a country with very complex national identities, so we have to be able to assimilate all these elements and make them our own. The Right is worried about us precisely because we managed to communicate a vision of the national-popular that can win, and that threatens their monopoly on state power. The recent debate in Podemos’s congress centered on whether the party should focus less on electoral politics and more on social movements. Ten months on, how do you reflect on that discussion? We trace our origins to the 15M [indignados] movement and the occupation of the city squares. But we also have to govern. And we have to govern while being aware that winning an election is hardly a revolution, particularly in a Western country where the popular classes demand a certain order and stability. We would face limits to do with globalization, the power of European institutions and the weight of nondemocratic powers, while also having to work with the PSOE. But if governing was not important, despite these limits, the Right would not mobilize all its resources to stop us from taking office. In the major Spanish cities where we control the councils, we are showing that governing can change things and that progressive economic results are possible even under neoliberal conditions. We have been able to combine good economic management with increased social spending and improved public services, while also tackling environmental issues and corruption. It is also essential to construct counterpower and popular movements in civil society. But these are not in opposition; it is much easier to do this when there is institutional support. A good example of this is the independence movement’s strength in Catalan society, which is in part because pro-independence parties have governed in Catalonia for a long time. When public television has a specific orientation and the institutions facilitate civil society organization and the creation of alternative forms of cultural production, it is possible to build up the strength of social movements. One of the traditional errors of the Left has been to oppose social movements and institutional engagement. In reality, institutions are a determining factor that can nurture these popular movements. Podemos does not aspire to compete with the work of the movement but we do want to form a part of them, creating a dialectical relationship between social organization and institutional work. We need a party with a trained cadre capable of governing but we also need activists who participate in social movements and who can create an internal democratic culture. This is not easy to build. The institutions have an enormous capacity for absorption and we have to be aware that despite being interrelated, movements and institutions will naturally experience contradictions and differences. But politics is exactly this — a dialectical relationship that involves fitting together contradictory realities. Another crucial question raised at the congress was your future relationship with the PSOE. How do you resolve the dilemma of having PSOE as a rival on the Left and part of the regime, and also a possible future partner in any government of the Left? This is a key question. In 2017, two striking parallel events occurred. First, at our party congress the corporate media attempted to intervene in our internal debates. Their aim was to destroy the party but they failed. It was the first time that the newspaper El Pais had been unable to condition the outcome of a left-wing party congress. The second thing that happened, which is even more remarkable, is the paper then failed to determine the outcome of the PSOE leadership contest. Pedro Sánchez won the primaries last summer saying something relevant to the configuration of political forces in Spain. He talked of plurinationality, cooperation with Podemos and the need to bring down Rajoy’s minority administration. I have no real confidence in Sánchez’s personal project but at a certain moment he seemed to be a figure that was willing to govern with us and who was open to dialogue on the national-territorial issue. It was an interesting scenario, in which it was possible to imagine a Spanish government willing to tackle the social crisis while also assuming responsibility for the territorial conflicts within the state. Ultimately, though, the maneuvers of the last few months have made this more difficult, with the pieces of the political chessboard now placed in a way that favors the Right. As we go forward, Podemos has to return to the type of intelligent strategies that allow for the creation of contradictions in our adversaries, taking advantage of internal tensions to break open the pro-regime bloc. Winning in politics is not merely about accumulating your own support, it is never a simple clash between two opposed forces. You have to be able to make other actors, who will continue to exist, move their positions and eventually become allies. There are many complex factors. We have to concentrate on redirecting the situation towards a scenario in which social rights, inequality, and the fight against corruption are the center of political debate, rather than the war of the flags. What is Podemos’s path to government today? And what would be the prospects for such a government in the current European disposition? With or without the sorpasso [Podemos overtaking PSOE], I believe Spain will only see a progressive change of government if Podemos and the PSOE reach an agreement. What matters during these moments is not who comes out on top, but the shared will for a political agreement to work in government in a different way. From there, we have to understand that the challenge of constructing a new Europe is a complex one. We need alliances but these alliances do not always work simultaneously. Alexis Tsipras and Syriza suffered the misfortune of winning an election at a time when they didn’t have any allies in Europe. They tried to reach out to Matteo Renzi; he turned his back on them. The same happened with François Hollande. They found themselves to be a small and weak state, with Germany using their own threat of leaving the EU against them. The experiences of the Portuguese government are interesting. It is not a revolutionary government, but it has demonstrated that fiscally expansive policies, without cuts, can produce economic results. It is a small country where the Socialist Party governs alone with the support of Bloco da Esquerda and the Communists, who do not have as many votes as we do. Nor is there territorial conflict in Portugal as there is in Spain. But a government in Spain could be capable of creating a territorial dialogue as well as more social policies which challenge the neoliberal direction of European politics. Spain is the fourth-largest economy in the eurozone. It is not a minor country, but it would probably have to push and work for alliances with other countries. Of course, we hope Jean-Luc Mélenchon will be the next president of the French Republic. We hope something similar happens in countries which don’t now seem to have such viable options. We are disappointed about the difficult situation the Italian left finds itself in, since it is the country we have studied and learned from most. The Five Star movement occupies the main critical space and, although it has some brave people, its political coordinates are quite a distance from our own. We also look to the UK, where a victory for the Labour movement under Jeremy Corbyn would be tremendous. In the US it is clear that Bernie Sanders would have been the best alternative to Trump, and we hope for Sanders or a similar candidate to emerge there for the coming election. But we cannot disregard or underestimate the rise of the far right. We are in a political scenario that is redolent of the 1930s. There are some interesting possibilities open in a progressive sense at present, but there is also a reactionary side to the scenario we find ourselves in, where new forms of fascism could appear. The contest is open. We will have to see. Tommy Greene is a freelance journalist, writer, and translator based in Madrid.